Scaboid is not a released bakugan. It is in the BakuSuper G series. Its Subterra version has 1300 Gs, its Pyrus version has 1280 Gs and it's Aquos version has 1100Gs. It will be released in November/December. 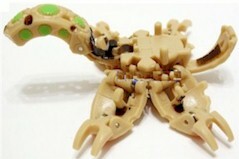 Purchase your Scaboid Bakugan from eBay now!